Murray Melburn Hanson of Carlingford, NB, passed away at Hotel Dieu St. Joseph Hospital on January 22, 2019 following a lengthy illness. Murray was born in Rowena, NB, on July 5, 1938. He was the son of the late Melburn Hanson and the late Mary Green. Murray leaves behind his daughters, Cindy McLaughlin (Carl) of Perth-Andover, NB, Jeannie Hanson (Janet) of Plaster Rock, NB; his sons, Murray L. Hanson (Anna) of Perth-Andover, NB, Kenneth Hanson of Carlingford, NB; his grandchildren, Kelly Flanders, Luke McLaughlin, Dayna McLaughlin, and Amanda Flaherty; his great grandchildren, Riley Flanders and Denver McLaughlin; his sisters, Sylvia Kilpatrick (Dawson) of Burlington, ON, Linda Senechal (Gene) of Fort Fairfield, ME, Doris DeMerchant of Carlingford, NB; brothers Dale Hanson (Lorraine) of Gladwyn, NB and Larry Hanson (Linda) of Rowena, NB; along with many nieces and nephews. Murray was predeceased by his parents; his wife of 58 years, Shirley Anne Hanson (Sullivan); his daughter, Penny Hanson; his son, Cecil Hanson; his sister, Joan Gartside; his brother, Robert Hanson; and his step-mother, Grace Hanson (Smyth). Murray enjoyed many outdoor activities and spending time with his family. 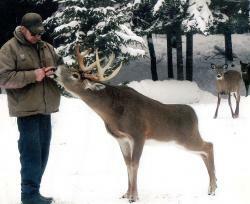 One of his true passions was feeding the deer out on the Odell. Funeral service was held on Saturday, January 26, 2019 at 2 pm from Brunswick Funeral Home. Rev. Roy Dee officiated. Interment will be in the Rowena Pentecostal Cemetery at a later date. Music for the service was by Barbara Moran and Rev. Roy Dee. The eulogy was given by Laney Sullivan. Pallbearers were Dayna McLaughlin, Luke McLaughlin, Carl McLaughlin, Clifford Nunn, Fred Davenport, and Robert Walker.